Great for coffee lovers! Available in three colors! 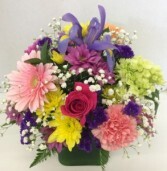 Carnations, Roses, Daisy Pomps, And Purple Statice. 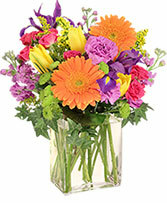 Mixed color frosted glass cubes filled with beautiful colorful blooms. 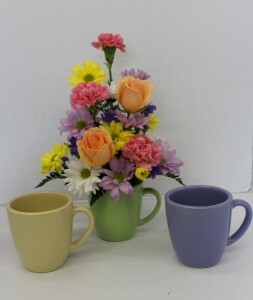 Arranged all around, it is the perfect centerpiece or table decoration for someone you love. 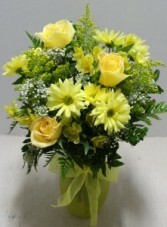 It includes gerbera daisy, iris, carnations, hydrangea, roses, daisy pomps, hypericum berry, and staice. colors of cubes vary.